Dry cell sealed technology. No vent tube or acid damage. Deep discharge reserve power 2 year storage life. 60% more starting power. UPS shippable. 2 year warranty (powersport) 3 year warranty (automotive, commercial, and heavy duty marine) Shipped fully charged. 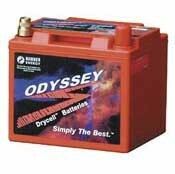 The ODYSSEY battery combines in one box the characteristics of two batteries. It can deep cycle as well as provide serious cranking power. The ODYSSEY battery is capable of providing engine cranking pulses of 1700A for 5 seconds as well as 400 charge/discharge cycles to 100% depth of discharge (DOD). A typical battery can do one or the other, but not both. A starting, lighting and ignition (SLI) battery, for example, is designed to provide short, high amperage pulses; it performs poorly when repeatedly taken down to deep depths of discharge. An ODYSSEY battery CAN DO BOTH !!! The ODYSSEY® battery, with a ten year design life and a three-to-eight year service life, saves you time and money because you do not have to replace your battery as often. It is also the ONLY battery that is capable of delivering a large number of deep cycles - up to 400 when fully discharged or up to 500 when discharged to 80%. Plus, the battery is specially designed for high vibration applications. Longer Storage Life Unlike conventional batteries that need to be recharged every six to twelve weeks, the ODYSSEY® battery, when fully charged , can be stored for up to 2 years at room temperature (25°C, 77°F). At lower temperatures, storage times will be even longer. The ease with which the ODYSSEY® battery recovers from this type of application abuse is unheard of. Should ODYSSEY® become deeply discharged, simply recharge following instructions in the ODYSSEY® Owners Manual. Superior Cranking and Fast Charge Capability The cranking power of ODYSSEY® batteries is double to triple that of equally sized conventional batteries, even when the temperature is as low as -40°C. Also, with simple constant voltage charging (alternator or independent charger), there is no limitation on the inrush current, so the user is assured of fast charge recovery. The sealed Drycell™ design of the ODYSSEY® battery eliminates the need for acid vent tubes; further, no routine maintenance is required and there is no more fear of acid burns or damage to expensive chrome or paint. 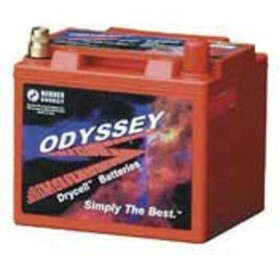 Owing to the starved-electrolyte design, the US Department of Transportation has classified the ODYSSEY® battery as a dry battery, so it may be shipped worry-free by UPS/Federal Express or by air. The ODYSSEY® battery may be installed in any orientation except inverted without sacrificing any performance attributes, or any fear of acid spillage. ODYSSEY® batteries are of military grade and have endured very rigorous tests that demonstrate their overall ruggedness and exceptional tolerance of mechanical abuse.